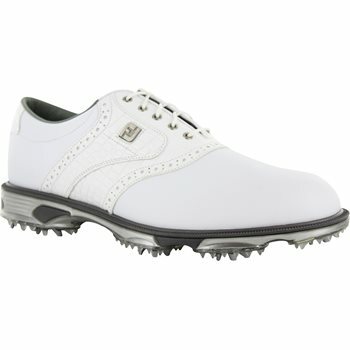 The FootJoy DryJoys Tour golf shoe blends traditional upper styling with new Stability PODS technology. It features ECL leather uppers, a new TPU integrated EVA midsole, and the Comfort Plus PU Fit-Bed. It has enhanced platform stability while maintaining comfort and flexibility. Laser Plus last. 2-year limited waterproof warranty. Have worn a lot of shoes through my golfing days and these are simply the best. The harder sole gives you consistent lie on any type of ground you may encounter. Love these shoes. Good looking, comfortable and dry. Can go out and walk 18 right out of the box. No need to break them in. The shoes are great and I would recommend them. The only problem I had was with the first 5-6 wears they were tough on the top of my foot near the ankle. Caused huge blisters. Once they were wore in they were fine. Awsome price, delivery time frame and quality service! I tee off at 5-6 am dry feet the whole round.